Tonight’s mystery has plenty of buzz. Will you bee all you can bee? Or will you succumb to the sting of defeat? Honey, here’s the challenge. What’s up with the color of that bee-yootiful queen? 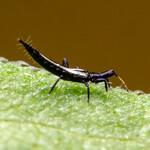 The cumulative points winner for the month of August will win their choice of 1) any 8×10-sized print from my photo galleries, or 2) a guest post on a safe-for-work topic of their choosing here on Myrmecos. While it remains a mystery why anyone thought a peaceful green daisy-dwelling insect was a bed bug, the correct identification is Miridae, or plant bugs. For their efforts, the indefatigable JasonC wins 6 points for nailing the family ID with some supporting information. Entomologist Julie Stalhut picks up 4 points for being the first to provide the technical term, and Weird Bug Lady (who makes amazing plush insects) gets 4 more for noting the wing venation. And I’m giving two points to Rob M because this was awesome. This brings us to the end of month, and to the announcement of the July winner: JasonC. Jason, please email me for your loot. Ok. So, not a bed bug. But what is it? Ten Myrmecos Points (TM) to the first commenter who can name the family of the mystery critter. Per our new rules, you must also give identifying characters that support your entry. 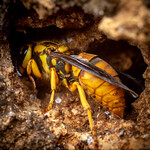 The cumulative points winner for the month of July will win their choice of 1) an 8×10-sized print from my photo galleries, or 2) a guest post here on Myrmecos. What was that ornately sculptured mystery object? It was the egg of the Question Mark butterfly, Polygonia interrogationis. I admit, I had an advantage over you folks. I identified the species watching the adult butterfly before she laid that egg on an elm leaf. Although several of you put in solid guesses, I am awarding no points for this week’s mystery. The single correct entry- by lepidopterist and blogger Chris Grinter– provided no supporting information as per our more stringent rules, and the entries with supporting info didn’t arrive at the correct ID. But don’t feel bad. This was an especially hard mystery, and one that I wouldn’t have gotten myself had I not spied the egg-layer in action. Have the aliens landed? Or is tonight’s challenge something more…terrestrial? Ten Myrmecos Points (TM) for the first commentator who can give me the correct genus and species, with supporting explanation. As so many of you guessed, the Getty Taxonomy Fail was not an Atta but an Acromyrmex. JasonC- who is rapidly emerging as the Monday Night Superstar- was the first to pick it. Eight points for getting the answer right and most of the way there with a supporting explanation. Two more points to NKanakis for a more precise discussion of the difference: Atta has two pairs of spines on the promesonotum, while Acromyrmex bears three pairs. Back when I lived in Paraguay, I learned the local Guaraní language distinguishes between the two genera. Ysaú for Atta, and Akéké for Acromyrmex. We don’t make such a distinction in English, where both lineages are called leafcutter ants. This ant is misidentified. The horror! To collect all ten points for tonight’s mystery, be the first to provide the correct genus-level identification. Breaking with tradition, you’ll also need to explain which character(s) support your answer. No exply, no pointsy.